The term Cruisemaster may evoke images of classic American automobiles on Route 66, but it also describes the essence of this 7.3m trailerable cruiser. Geoff Green went aboard. The Rayglass Cruisemaster is the only powerboat I know of that supports a model-specific cruising club. The Cruisemaster Club is an informal but efficiently run group aimed at promoting safe, hassle-free cruising and social contact amongst Cruisemaster owners. Andrew Seeley, club president and one of the first to buy a Cruisemaster when they were released in April 1999, says they have 13 boats on their register. "Rayglass have sold around 30 Cruisemasters and all owners are welcome to join, but some are members of other clubs or wish to do their own thing," he says. The common denominators are that the members enjoy the cruising lifestyle and can afford a Cruisemaster (a turn key boat on a trailer ready to cruise starts at $121,700). Andrew says there is a core group with young families of similar age and the balance of the membership is made up of couples with adult children who have gone their own way. The organised trips are mostly overnighters or long weekends, although Andrew's Cruisemaster compatriots, Des and Ann Elliott, say the boat should not be labelled as a weekender. "It provides a big boat experience in a relatively small package and we cruised Great Barrier and Kawau Islands for two weeks at Christmas. It's much more than a weekender," says Des. A fair percentage of Cruisemasters are sold with trailers and many owners live relatively close to launching facilities. Adam Wicks, sales manager at Rayglass, says that although the boat has a towing weight of around 2700kg when fuelled and provisioned, there are not any real towing issues. "Most of the owners are pro-active. They tow with capable vehicles and have fitted driver-controlled brakes to the trailers." While the Cruisemaster Club aims to be low-key, it does provide a comprehensive handbook to members. Its purpose is to inform not regulate, and it highlights past operational and maintenance experiences. Andrew says he thought it a good idea to document information so new owners could move quickly up the Cruisemaster learning curve. The handbook provides systems information, maintenance tips and operational data, including range and endurance at various speeds. A 5.7l Mercruiser powers the majority of Cruisemasters so the performance information applies to most of the fleet. 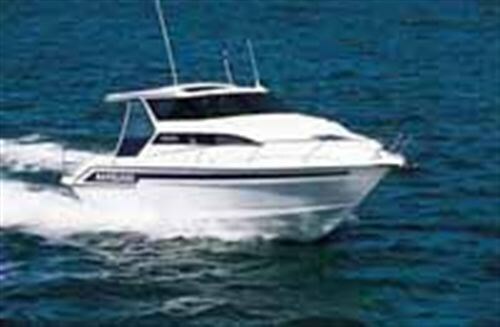 Those not fitted with the standard engine option are powered by a more powerful 350 Magnum Mercruiser. In its original form the Cruisemaster featured a Portifino stern with a boarding platform about 450mm deep. A bolt-on extra now extends this to 900mm, and the additional depth enables the dinghy to be stowed across the back of the platform while retaining access and providing room to fish. Andrew says doubling the size of the platform has made a huge difference and most owners took an instant liking to the concept. In keeping with its cruising brief, the Cruisemaster provides all the necessary cruising amenities, including two double bunks, an enclosed toilet and shower, provision to mount two tables and a compact but comprehensive galley. Andrew says the berth in the bow sleeps two adults or three young children comfortably (a privacy curtain can isolate this berth from the rest of the boat), and the cockpit berth sleeps two adults comfortably. The double berth is constructed using traditional construction rather than being a moulded fibreglass unit as used by Rayglass in their acclaimed Legend series. The reason? The Cruisemaster is built under contract by Whittley in Australia (Whittley produce the Legend range under licence in Australia and market it under the Sea Legend banner). Although it's built to a New Zealand specification the Australian factory still prefers to use timber and plywood construction in some non-structural areas. The port-hand galley unit is constructed using a fibreglass frame that provides rounded corners and rebates to accept the teak plywood panels. This system provides single entity modular construction with timber highlights. The bench top and fascia for the sliding cupboard above it are moulded as a single unit for long-term integrity and easy cleaning. A one-touch tap (hot and cold) services the sink and a 12-volt Ingle fridge is fitted in the cabinet beneath it. A two-burner alcohol stoveis also fitted in the bench top and a microwave is positioned next to the fridge. A drawer and cupboard take up the remainder of the space available in the galley unit. The enclosed head and shower is opposite the galley and a macerator toilet (electric) is fitted as standard. Some owners are experimenting with holding tank options so the family can make comfort stops during the night (untreated sewage can not be discharged within 500m of shore or a marine farm, or in waters less than 5m deep). The toilet compartment is fitted with a shower and another can be found on the boarding platform. "The shower in the head is functional and this tends to be used by the adults, while the kids usually want to rinse off after swimming so they gravitate to the shower on the platform," says Andrew. "With careful monitoring the 130l water tank has lasted us four days." Hot water is supplied from an engine-heated 30l hot water cylinder which delivered very hot water in the time it took us to motor from Half Moon Bay to Bean Rock, about 25 minutes. The helm station is raised 300mm off the cockpit floor and the helm seat is constructed using the same fibreglass frame and timber panel construction found in the galley. All round visibility through the armour glass screens and sliding side windows is excellent (a wiper is fitted to the windscreen). The large sunroof, which gives the helm area a spacious outdoor feel, and also provides the opportunity for the helmsman to stand with his head and shoulders above the cabin top, is a fundamental feature of the boat and a great plus. The helm seat seats two people (lots of storage within the seat and there is an insulated chilly bin under the helm floor) and there is an additional folding passenger seat to port. This folds away to make egress through the boat easier and is quite comfortable to sit on. 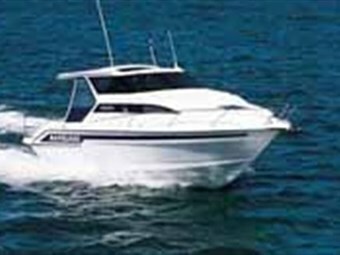 The cockpit is a reasonable size and the hardtop extends to the transom to optimise the layout for cruising. 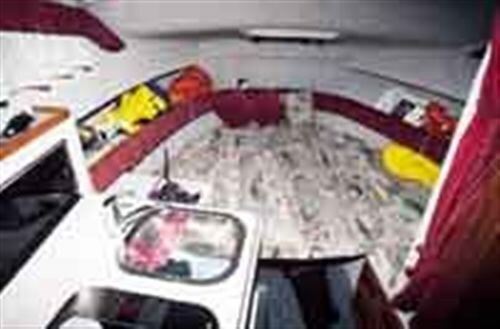 The cockpit double bunk is assembled using five segments that lock in around the engine box. The bed process includes using the cockpit tabletop and, for a first time viewer, looks to be a bit of a jigsaw. However, Andrew says it goes together quickly and is both comfortable and stable to sleep on. During the course of the day, I asked two Cruisemaster owners what they thought the key features of the boat were. Both said it was a capable sea boat that provided comfortable live aboard facilities. In addition, they mentioned the open plan layout was conducive to socialising and that there was ample storage throughout the boat.